In 2017, the S&P 500 Index did not experience any corrections greater than 5%. So far in 2018, there have been three such market drops. So which year represents the more typical investor experience? History shows us that the relative calm of 2017 was an outlier, and that losses and volatility are recurring events that investors should be prepared for. It’s not uncommon for the S&P 500 Index to experience corrections greater than 5%. As the table below shows, there have been 15 such declines since April 2011, with each year – except last year – experiencing at least one. In all but one of these periods, the S&P 500 Low Volatility index outperformed the S&P 500. Source: Bloomberg, L.P., as of Oct. 29, 2018. The growth potential of stocks is a foundational part of many portfolios, but smoothing out the ups and downs of the stock market may be an attractive prospect for some investors. That’s where the Low Volatility factor can help. On average, the S&P 500 Index lost an average of 9.01% during these 15 downturns, while the S&P 500 Low Volatility Index lost only 4.71%. This is important because a lower “down capture” means that the index has fewer stairs to climb in order to recapture its prior peak. Return math helps illustrate this point: If the market declines by 50%, it takes a 100% return to return the point where the sell-off began. Losing less can provide the foundation for generating competitive returns across the market cycle and smoothing out an investment experience. 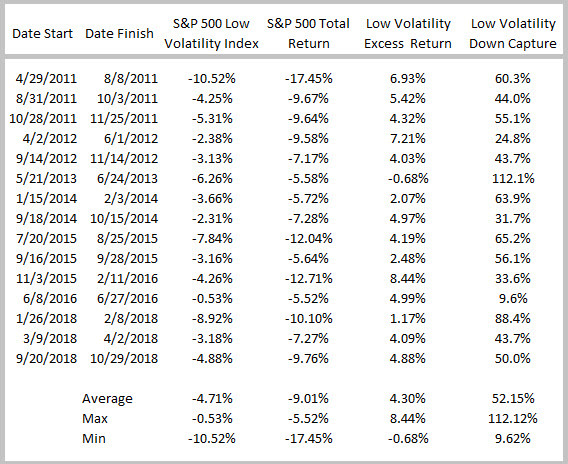 Historically, the S&P 500 Low Volatility Index has tended to capture about 75% of the S&P 500’s upside and about 50% of its downside.1 In other words, it has participated in market rallies (not fully) and market declines (not fully), and it possesses a different risk/return profile than the S&P 500 Index. Investors looking to mitigate risk and cushion the impact of market declines on their portfolio may consider the Low Volatility factor. Invesco has several strategies that can help. How has the low-volatility factor performed in recent markets – and why? 1 Source: Bloomberg, L.P. Between April 30, 2011, and Sept. 30, 2018, the S&P 500 Low Volatility Index had an up capture of 73.6% and a down capture of 44.8% compared to the S&P 500 Index. Down capture/up capture refer to the amount of downside/upside in the broader market that is captured by an index. The S&P 500® Low Volatility Index consists of the 100 stocks from the S&P 500® Index with the lowest realized volatility over the past 12 months. Factor investing is an investment strategy in which securities are chosen based on certain characteristics and attributes. Factor-based strategies make use of rewarded risk factors in an attempt to outperform market-cap-weighted indexes, reduce portfolio risk, or both. Low volatility cannot be guaranteed. This does not constitute a recommendation of any investment strategy or product for a particular investor. Investors should consult a financial advisor/financial consultant before making any investment decisions. The opinions expressed are those of the author, are based on current market conditions and are subject to change without notice. These opinions may differ from those of other Invesco investment professionals.